I’m taking a little break from quilting so the blog will be quiet for a bit. Summer is finally here and I am going to soak it up as much as I can as it is such a short season. I’ve been out in the kayak or just sitting down on the dock with my feet in the water. We have some fun plans with the boys next week and then my sister is coming to visit! Back in April at our guilds Quilt Show Lori was here visiting and as we were shopping the vendor surrounded by beautiful batiks we realized we needed to buy fabric for a quilt. So we decided to make a sample of our Pedal to the Metal Quilt C as we didn’t have that one on hand as the original one was made by a friend who tested the pattern for us. This also lead to the decision to redo our pattern cover as it didn’t have a proper focus or show the woven effect of Quilt A . We were really rushed the day we did the original cover so I wanted to give it another try. I was hoping to get another outdoor shot but trying to get three quilts in one shot was proving to be very difficult. Also the weather has been pretty miserable this spring, lots of rain and wind so I thought I would give indoor photography a try. Not my strong suit but I’m happy with the final result! I cleared out the living-room furniture and hung Quilt A on the wall and then used my quilt ladder to hang Quilt B + C. I think this layout give the pattern cover more of a focus. 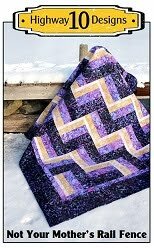 I used a new pantograph called Allium which might become my new favourite panto for light density quilting! Love how this quilt looks on the limestone rocks! The navy diamonds really pop. Back in June I taught a two day Beginner Quilting Class at our guild. At our Quilt Show in April we advertised that we would be offering a Beginner class to all new members that join our guild and we had 12 people sign up and attend. It was a great way to bring in new members to our group. We chose the Mahjongg Quilt Pattern and this is the sample I made for my demonstration for the class. 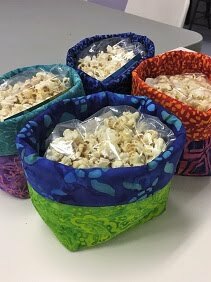 Our guild has a blog as well that I now write and we post pictures of our Show and Tell so please feel free to follow that blog as well! 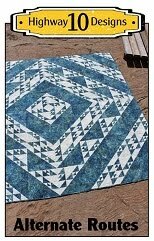 Here is the link - North Star Quilt Guild Blog. This will be a Comfort quilt that our guild will donate to a local charity and I’m sure a little boy will love this quilt! I used the Popcorn panto and the guild gave me Hobbs 80/20 batting. I usually don’t like Hobbs batting but this one was better than the last roll the guild purchased. The loft is more even than on the last roll we had so that was nice to see! The weather has been cool, windy and rainy here all week so I hope we are done with all that and I can start enjoying summer again! The paper versions of Quarter Sections is finally in my hands! You can find it on our Etsy shop or if you're a local quilter I’ll have them at our guilds UFO day Saturday and the guild meeting on the 15th. This past week I have enjoyed custom quilting my Metro Hoops quilt that I pieced back in January. This pattern is by Jenny Pedigo of Sew Kind of Wonderful using her Quick Curved Ruler. 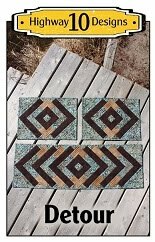 If you have followed my blog for awhile you know I love making Jenny’s patterns and using her Quick Curve Ruler. After I pieced the top I made a few sketches of what I wanted to do for quilting designs, I knew right away what I wanted to do in the center of the circles and in the blue diamonds but no idea what to quilt in the background between the circles. I decided to just load the quilt and see what happens. Well after glancing at the cover of the pattern I realized that I like the vertical lines Jenny did as it allows the design in the circle to be the focus so that’s what I did. For the main quilting design I created a double lined square and pebbled between the double lines. Added a feather motif to the curved area and a Petal feather in the center. I used the same Petal feather in the blue diamonds. I stitched in the ditch along the curved piecing and between all the piecing in the rings. I used one layer of Quilters Dream Blend batting, White So Fine thread on top and White Bottom Line thread on the back. Thought I would add a few before and after pictures as I enjoy seeing the transformation that the quilting creates. I used a Moda Jelly Roll for this quilt, it was Kate Spain’s Sunnyside collection. Yes ‘Cupcakery’ is a word…well it’s the name of the fabric line by Me-O-My that I used to make my quilt. 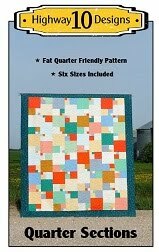 I purchased this cute fat quarter bundle a couple of years ago and recently did a search and found out it is from 2011. It is hard to find now but I did discover that Me-O-My has a new line with an ice cream theme that is just as cute! I used our Quarter Sections pattern and tested the idea of using directional and busier prints for our pattern and I’m happy to report it worked quite well with a bit of planning. 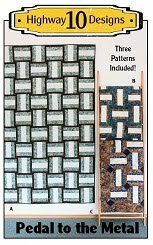 I just had to remember that for this lap sized quilt the blocks in 4 columns are turned up and that the blocks in 3 columns are turned down so place the directional fabrics according. It might not be a good idea for a beginner too tackle with directional fabrics but if you don't mind working with directional prints and do a bit of pre-planning then there is no problem. I’m pleasantly surprised how much I love this quilt and I got to use up fabrics from my stash. Yes my stash is finally growing but I hope to put a dent into it this summer. I used a pantograph called Sweetness that has a cupcake theme as well. I had purchased it a few years ago for a clients quilt and it worked out perfect on this quilt. I don’t usually use a busy panto on a busy quilt but since it’s mine I took the chance. I like how the cupcake quilting shows up on some of the plainer blocks. I used the Flourish pantograph, white So Fine thread and Quilter’s Dream Blend batting.